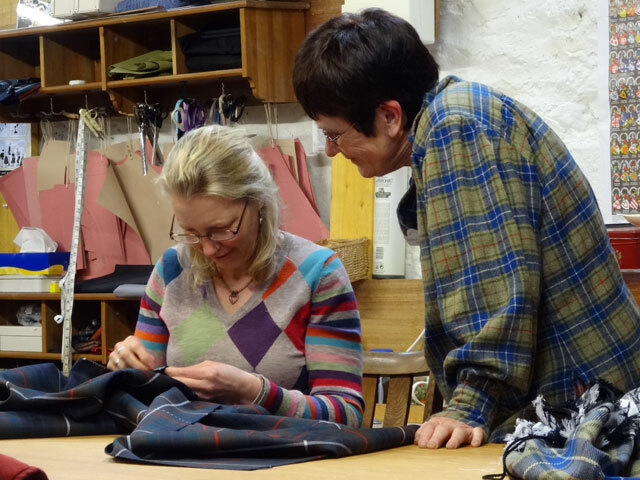 Today Rachel was running one of her kilt-making courses (on her own without Ann!) for Kim who is catching up so that she can be slotted in with the other course which is running on Fridays. I popped in and took the picture at the head of this entry. What a good time they were having. I spent the morning dealing with emails and letters and then, after lunch (we get lunch when a course is running) I stripped down and cleaned the boat toilet. David arrived to change the battery in the boat and Rachel ran me up to Duns to collect my car which is now running again. We have a full fleet of working vehicles once more! After a shower, I got ready for presbytery – it is a miserable day, rain and cold, totally different from yesterday and similar to the weather on Sunday. Depressing – and that’s without remembering the cricket scores, Durham trounced by Middlesex and England a couple of days ago defeated by the West Indies. Ah well. I was up at the presbytery in good time and the meeting was uneventful and conducted in a happy, positive way. I say ‘uneventful’ but actually it wasn’t quite that because I noticed that quite a few more people are participating than I remember before and that can’t be anything other than good news. I came home after the meeting and prepared the minutes which I sent out to everyone before going in to the Granary to catch the news and all of the election propaganda. It seems that the polls are quite sure that this is going to be a hung parliament and that the SNP will do well in Scotland, perhaps even winning fifty of the fifty-nine seats on offer. While that would please me, I can’t quite imagine that the winning majority will be on that scale.